Data to Dome 03/14 - International Planetarium Society, Inc.
Top: Cosmic ray showers illustrate interactions of particles traveling at nearly the speed of light. Below: The Pleiades simulation illustrates stellar evolution and gravity dynamics taking place over 100 million years. is big and old, really big and really old. Within those truths lies an incredibly rich story, one that can provide the storytellers of the universe with endless material. We’ve been doing a great job telling the story of scale. The software driving digital planetariums can fly us out to the edge of the observable universe and then zoom in to view molecular structures. A dizzying range of scales. The universe is also dynamic, however that dynamism often occurs over time periods not well matched to human perception. Unraveling the dynamism of the universe in our planetariums requires messing with time, running it really fast and really slow, jumping forward and back to witness key events. Our digital planetarium software packages all do this very well when simulating the solar system. Timescales from seconds to centauries can be manipulated with ease. What I’d like to argue in this article is that these capabilities need to be advanced so that we can handle cosmological timescales. We should be able to watch the 14-billion-year history of the universe and then zoom in and watch the future evolution of our sun as it becomes a red giant. We need to do for time what we’ve already done for scale. The technology is ready for a major push forward in interactive simulation data. While we are a long way from being able to visualize the number of particles and size of volumes produced by cutting edge computational simulations, what we are able to show is sufficient for illustrating a wide range of astrophysical processes and events. For many purposes, having the ability to freely move around and explore while the simulation is taking place outweighs the advantage you get in resolution playing back a rendered visualization. To that end I’d like to announce a new initiative whose goal is to jump start the variety and quality of interactive simulation data available to digital planetariums. 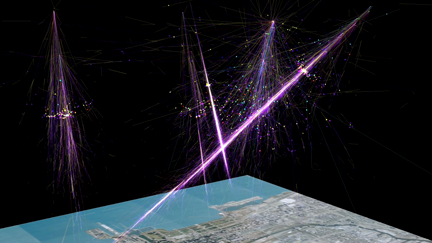 The Space Visualization Laboratory at the Adler Planetarium will curate a collection of astrophysical simulation modules. The goal will be to start with a collection of modules that would allow the planetarian to tell stories of the dynamic universe spanning a wide range of timescales. We plan to assemble these datasets so that they are ready to present at the June IPS meeting. Although we will be preparing modules for the three software platforms that we use at the Adler (Uniview, Digital Sky and WorldWide Telescope), I am more than willing to work with software vendors who would like to have these modules available in their systems. I encourage software providers to contact me if you are interested in having your platform supported as well. The formation of the large scale structure of the universe from the Big Bang to today. The future history of the sun and the solar system from today to five billion years in the future. The evolution of an open cluster spanning 100 years. The evolution of a globular cluster spanning billions of years. The merger of two white dwarfs spanning days. Cosmic ray air showers lasting approximately 50 microseconds. 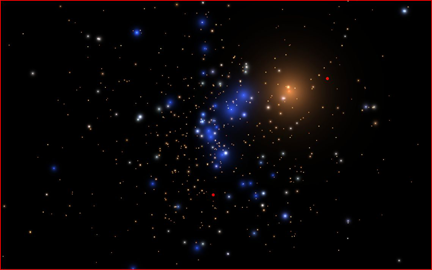 The open cluster simulation was developed by Aaron Geller, a National Science Foundation Astronomy and Astrophysics Postdoctoral Fellow (AAPF) at Northwestern University and the University of Chicago. Part of the duties of an AAPF fellow involve education and public outreach, and Aaron has been working with me developing visualizations and presenting them to the public. The simulation was designed to represent the Pleiades, 1,000 stars evolving for 100 million years. Let me give an example of how it might be used in a planetarium show. Imagine starting with a view of the night sky, helping the audience locate the Pleiades using the constellation Orion (and throwing in a little mythology if you are so inclined). Now fly out the 400 light years to the Pleiades, and when we get there we’ll not only see the stars, but also a volumetric model of the Maia reflection nebula in which they are embedded. Tell your audience that we can see this cluster not only as it is, but as how it came to be. Turn back 100 million years to the start of the simulation and start running time forward, one million years per second. Now you can describe stellar evolution: the brightest stars evolving first, becoming red giants, and then exploding as supernovae. We can see the stellar remnants, the neutron stars that are left behind. Many of these are ejected from the cluster at high velocities, which is a little unsettling if you think about it too much. We can also watch the intricate dance of gravitational dynamics and interactions, and watch binary stars exchange partners and occasionally collide. Pulling back farther, we can see how the tides from the Milky Way are pulling the cluster apart, in much the same way as our sun was separated from its sibling stars billions of years ago. This just an example of the stories that can be told with these kinds of simulations. Including the fourth dimension, in all its richness, will be a significant advance for our field. Beyond that we can imagine not only playing back simulations, but running them in realtime. Programmable graphics shaders allow us to run gravitational n-body simulations in real time. Imagine letting your audience pick two galaxies and them setting them off on a collision course. Future audiences could participate as creators, designing their own simulations and running them.